Why Does Your Site Need To Be Responsive? There are now more mobile devices on Earth than there are people – and as almost 60% of all website traffic comes from these devices, it’s never been more important to make sure your site is designed and developed with mobiles in mind. A responsive design means your site can be used and enjoyed by users on any sized screen or device – which will not only give your users a better experience, but also boost your SEO. There are almost too many reasons why a responsive site is good for your business, so we’ll only cover the advantages with the biggest impact for your business. Having a mobile website is no longer just a nice feature, it’s become a necessity and literally impacts the growth of your business. Search engines like Google now take responsive design into account when returning search results. Because responsive websites provide a better user experience, they will perform better in search rankings than sites that are not mobile-friendly. Google also prefers the fact that responsive sites have a single URL, rather than a separate mobile version, as the Google bot can crawl your website more easily. Furthermore, since Google uses a different algorithm for mobile searches, users searching for your site on a mobile device will see responsive websites ranked much higher than those that are non-responsive. You’ll see improved bounce rates, higher search rankings and more conversions. In the competitive world of SEO, it’s never been more important to make sure your site is fully optimised for mobile users. A user-friendly site makes it easier for visitors to find, absorb and share your content. 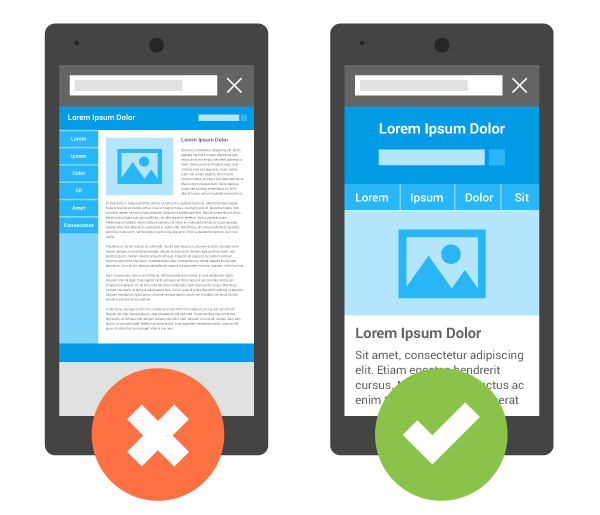 If a mobile user is presented with a tiny, unusable desktop version of your site, they are very likely make a swift exit from your site (damaging your bounce rate). However, a scaled down, responsive design will mean your site looks great on any sized screen, and users will receive the best possible experience. It will be easier for them to navigate your site, enjoy your content, and most importantly, engage with your business. If your digital marketing strategy includes blogging or social media, it’s especially important that your website is fully responsive. Since 55% of social media consumption happens on a mobile device, these methods can dramatically increase your mobile traffic. If you’re sharing links to your blog or other content and don’t have a mobile-friendly site, you’ll not only see high bounce rates and low conversion rates, but also a frustrated audience. No mobile users like to use a poorly designed, unresponsive site, so they’re unlikely to stick around no matter how engaging your content is. Apart from SEO and user experience, a responsive website design can also have a positive impact on your brand’s reputation. When visitors see that your website is mobile-friendly, they’ll understand that you have invested time, money and effort into providing them with the best possible user experience and that you’re commited to the future. Another benefit of a responsive website is that your site is ready for whatever the future may bring. With technology changing at such a fast rate, it’s impossible to tell whether future devices will be smaller, bigger, or even whether new devices (such as TVs, watches, glasses etc.) will be used for web browsing. With a responsive design, you can be confident that your site will continue to deliver a good user experience and be usable on any sized device – making you ready for the future. With so many smartphone users, customers want and expect a good mobile experience. If you haven’t already, make sure your site is fully responsive and mobile-friendly to help boost your SEO and make your website usable for users on any device or screen size. Web-Feet creates fast, usable mobile-friendly sites that your visitors will love interacting with. Contact us today to find out more about our responsive design services.